This is the best cleaner for your reptile's habitat; used and recommended by exotic animal vets for cleaning your cages and other habitat items. We love this anti-bacterial, anti-fungal cleaner because it is easy to use and non-toxic to our reptiles. Basically, you spray and wipe and then if your reptile licks where you just cleaned, it won't hurt them. Great for daily maintenance cleaning as well as monthly cleaning from top to bottom. Chlorhexidine is also helpful if your bearded dragon has some stubborn shed and you want to avoid the possibility of fungus between a double-shed area. Just pour a small amount into their bath water so that it barely turns a pale blue and let them soak. Using a soft bristle tooth brush and brushing gently against the direction of the scales will help too. Ergonomic sprayer holds 32 ounces of working strength chlorhexidine, plus 2 additional refills; just fill sprayer 75% full with distilled water, add the Chlorhexidine Solution 2% and finish filling sprayer up to circular line on the neck of the spray bottle. Using distilled water is said to prolong the "freshness" of the working strength solution, however we simply use tap water as we feel ours gets used well before any diminished effect occurs. See also our Carolina Custom Cages' listing for "Chlorhexidine Solution 2%; 3 refills make 32 oz. each of working solution". Carolina Custom Cages is a division of Carolina Designer Dragons, Inc. This is the best cleaner for your reptile's habitat; used and recommended by exotic animal vets for cleaning your cages and other habitat items. We love this anti-bacterial, anti-fungal cleaner because it is easy to use and non-toxic to our reptiles. Basically, you spray and wipe and then if your reptile licks where you just cleaned, it won't hurt them. Great for daily maintenance cleaning as well as monthly cleaning from top to bottom. Chlorhexidine is also helpful if your bearded dragon has some stubborn shed and you want to avoid the possibility of fungus between a double-shed area. Just pour a small amount into their bath water so that it barely turns a pale blue and let them soak. Using a soft bristle tooth brush and brushing gently against the direction of the scales will help too. 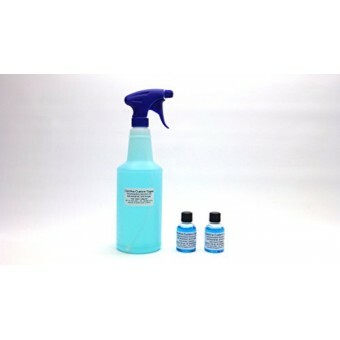 Ergonomic sprayer holds 32 ounces of working strength chlorhexidine, plus 2 additional refills; just fill sprayer 75% full with distilled water, add the Chlorhexidine Solution 2% and finish filling sprayer up to circular line on the neck of the spray bottle. Using distilled water is said to prolong the "freshness" of the working strength solution, however we simply use tap water as we feel ours gets used well before any diminished effect occurs. See also our Carolina Custom Cages' listing for "Chlorhexidine Solution 2%; 3 refills make 32 oz. each of working solution". Carolina Custom Cages is a division of Carolina Designer Dragons, Inc.
Each of these 3 refills will produce 32 ounces of working strength chlorhexidine; just fill sprayer 75% full with distilled water, add the Chlorhexidine Solution 2% and finish filling sprayer up to ci..